https://24-viagra.com/ how to buy viagra? side effects of drugs like viagra include Dunia Baru, means ‘New World’ in Indonesian. This fabulous phinisi style super yacht offers her guests amazing adventures throughout the eastern Indonesian Archipelago. The most majestic traditional-style super yacht ever built in Indonesia will carry you through these hauntingly remote, heart-achingly beautiful islands, full of enchanting people. The Dunia Baru will take you to the most mysterious corners of this land of adventure, to see the Asmat tribes of Papua, the whale hunters of Alor, Raja Ampat, the holy grail of diving, and the dragons of Komodo. Dunia Baru offers the ultimate adventures with unparalleled luxury. peut on acheter du viagra a la pharmacie sans ordonnanceur She has been superbly designed throughout and offers a vast array of hi-tech amenities. She was over 6 years in the making and when you consider that even the wardrobe hinges or door latches have been lovingly hand-crafted from the finest Indonesian teak wood, you can easily see why. The Dunia Baru is the embodiment of detail and care and boat design perfection. Everything about the Dunia Baru is world class. go There is a crew of 16 on board to pamper guests. Hospitality is a way of life to them. Many of the proud crew helped to build the Dunia Baru and they called it home while they did so. The crew’s welcome is warm and heartfelt and they genuinely want guests to share in this beautiful creation with them. diamox drug contraindications with viagra On Dunia Baru, the choices are limitless and the possibilities endless. Your own private paradise within paradise! levitra in uk Once you set foot on deck, you will be surprised by the beautiful details, the enormous deck areas, the astonishing woodwork and the incredible décor throughout. viagra false positive drug test The Dunia Baru effortlessly shows how old and new can be teamed together in terms of her stunning design. Traditionalists will relish the craftsmanship and detailing of classic Indonesian wood work while modernists will be blown away by the fully integrated sound, light and entertainment system on board that can be controlled by Ipad from anywhere on the boat. align drug ingredients viagra The way this yacht brings together the romantic exterior of the classic Indonesian phinisi with a super yacht interior is nothing short of exquisite. The Dunia Baru offers a vast amount of space within her 50m length and massive 11m beam. Within her 3 decks, there are many different areas to be enjoyed or to entertain in; some open to the sun and others are under cover or private. 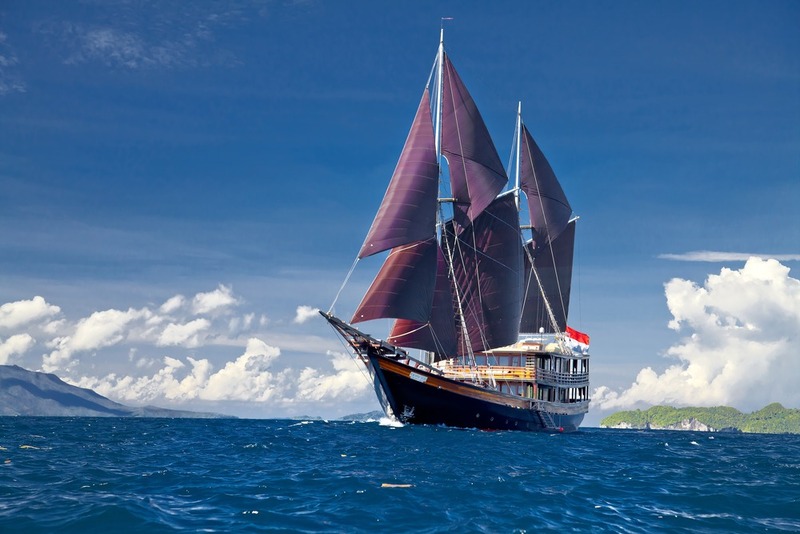 Simply perfect for cruising the equatorial waters of the Indonesian archipelago. One of the most impressive features of the Dunia Baru is her incredibly spacious full beam master suite, complete with 190 degree panoramic views, private aft deck with day bed and large bathroom with oversized shower. With large windows throughout, to call the VIP suite ‘sumptuous’ would be an understatement. The remaining 6 air-conditioned spacious suites, offer luxury and comfort in abundance complete with TV and sound system. Choose to eat on the solid teak table on deck, white linen, soothing sea breeze and a waiter for each guest. Or perhaps take it easy in the teppan-style aft galley with its big open cooking range, high stools, all too accessible wine cellar while listening to music of your choice on the boat’s Sonos 14 Zone Integrated Sound System. A long perfect evening guaranteed! The Sonos 14 Zone Integrated Sound System with Music Server is Touch Screen Controlled and covers every room and outside area. There are 30 hi-fi quality speakers and sub-woofers and Ipod docking systems which can all be controlled from an Ipad. The Dunia Baru is equipped with all the latest technology including worldwide communication and broadband wireless internet. Lastly, and surely a stroke of genius, the Dunia Baru features 34 incredible underwater LED lights. This not only creates an amazing visual effect at night but it also attracts its own marine eco system! With the lights on, aconstant school of feeding fish are attracted to the boat and, if you are lucky, maybe mobula rays or even the odd dolphin! The food continues the theme of fusing together the old and new. Traditional Indonesian recipes, that have been passed down the generations, are reinterpreted and presented as new and rejuvenated and yet they are just as delicious. Local herbs and spices meet the finest cuts of meat, organic fruits and vegetables sourced from the rich volcanic soils of Bali and Flores, seafood fresh out of the Indian Ocean; all of these elements are combined in perfect harmony and served to our guests on hand-made local dinnerware.